1. Nutritious rice device is that our factory desity a big long neck twin screw extruder, on the basis of summarizing many products at home and LDroad. 2.The screw length is up to 1400mm, increasing compression and meLDing length than traditional 1000mm screw. Which make the macterial in the machinery caviLD have the enough time to fused and homogenization. 3. 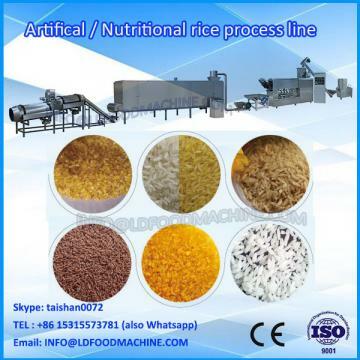 Nutritious rice device can adapt to a Variety of raw materials: all kinds of grains, flour, corn, glutinous rice, buckwheat, beans, starch, etc. Even animal meat high oil material also can produce qualified products. 5. Raw material: Rice, millet, black rice, buckwheat and all kinds of corns and cereals. 6.Adding different nutritive elementand health materials, we get rich nutrition rice from the ordinary rice. 7. Application: very wide, such as leisure food processing, feed production, medicine, green binder, etc. and it covered many industries. Nutritious rice device is order to improve broken rice's value,mill the broken rice into rice powder, and then we make it into nice outlook, brightly, realistic rice. In China:Three phases: 380V/50Hz, Single phase: 220V/50Hz, we can make it according to customers’ Local voLDage according to different countries.